This summer, Upper Iowa University’s Team Peacock will celebrate 15 years of pedaling in the Register’s Annual Great Bicycle Ride Across Iowa (RAGBRAI)—the oldest, largest and longest bicycle touring event in the world. Team Peacock will be making the 427-mile trek across the state of Iowa from July 21-27 and you can be part of the team. The 2019 RAGBRAI host communities include Council Bluffs, Atlantic, Winterset, Indianola, Centerville, Fairfield, Burlington and Keokuk. There’s a huge value in joining Team Peacock. In addition to gaining lots of new friends and enjoying camaraderie along the ride, Team Peacock will pay each rider’s RAGBRAI wristband fee ($175 value) and provide new riders with a Team Peacock biking jersey ($60 value). Enjoy the luxuries of the Peacock Support Crew. These dedicated team members take care of camping accommodations on the route. Locations vary, but in the past they have included alumni residences, city and state parks. The Team Peacock crew will set up camp each day for riders. This includes popping up the tents and making available portable hot showers and restrooms when not provided by a host. The drink station and breakfast/snack bar includes water, sports drinks, ice, light snacks, bananas and coffee. In addition, daily laundry service is provided for the riders’ cycling gear. Transportation services will ensure all personal camping gear is safely and securely transported to the starting point as well as each town along the route. Each rider shall pay a $125 week-long camp fee (or $30 per day for daily riders) which covers all the services and amenities previously mentioned. Since 2005, the 30-plus member UIU team has used this celebration to raise more than $1 million to support students and University projects. Each participant may select a UIU project or program to support. Options include, but are not limited to, scholarships, military initiatives, athletics, and UIU Deans and Annual funds. 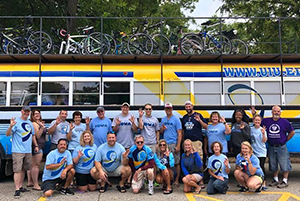 The Alumni Office will provide some marketing and fundraising support for riders, but ultimately it is up to each participant to creatively and aggressively meet their goal. Goal fulfillment is required by Friday, July 12. To officially join the team roster, riders must complete the 2019 Rider Agreement Form at https://bit.ly/2RoSxJs. For additional information, visit uiu.edu/TeamPeacock or contact Team Peacock Committee member Brenda Luzum at luzumb@uiu.edu or 563.425.5238.